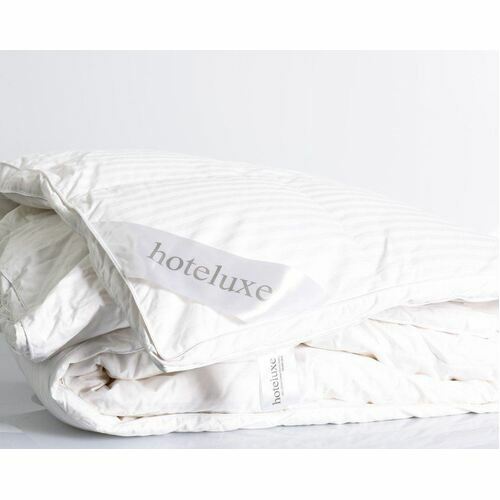 The ultimate in luxury and arguably one of the best quilts you can buy, this sumptuous choice is worth every cent. Filled with cloud-like goose down clusters (renowned for being supremely large, lofty and cozy), it feels unbelievably light yet brilliantly warm. 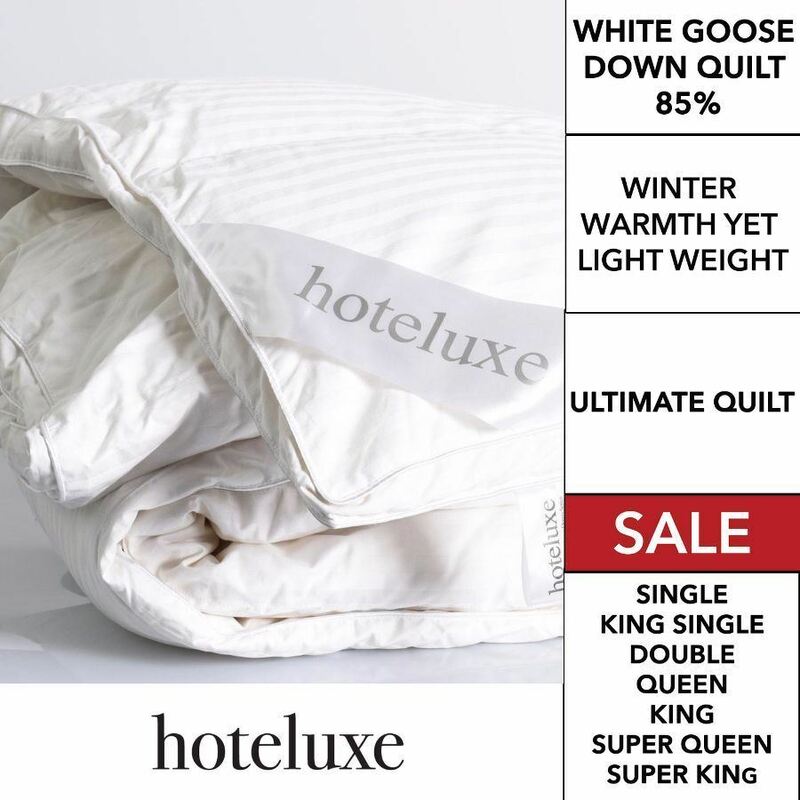 Encased in silky-smooth 500-thread-count cotton sateen and finished with an internal box construction for even warmth (meaning no cold patches or movement of down), this quilt will keep you the perfect temperature all night. Douse yourself in comfort. Goose down clusters efficiently expand and loft to fill up space and trap tiny pockets of air. 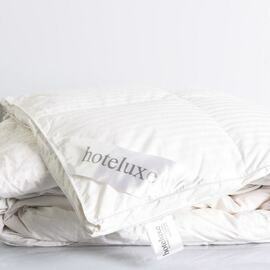 This optimizes warmth regulation to keep you cozy the whole night through. 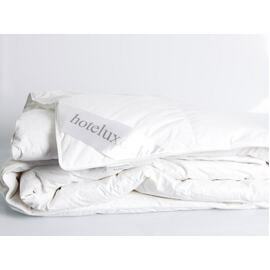 Create your own irresistible haven with soft, billowing bedding that only luxurious goose down clusters can provide. Fall in love with the mere sight of your bed after just a single night in your new down quilt. Goose down keeps your temperature consistent with built-in sweat and moisture wicking that keeps you from overheating. The super lightweight material also lets your body breathe while trapping in just the right amount of welcoming warmth. What Percentage Should I Buy? Whats the Difference? The following percentages are ranked in order of the warmth to weight ratio and loft properties. Goose Down performs the highest in warmth to weight ratio when compared to Duck Down, Wool, Bamboo, Cotton, and other synthetic fibres. 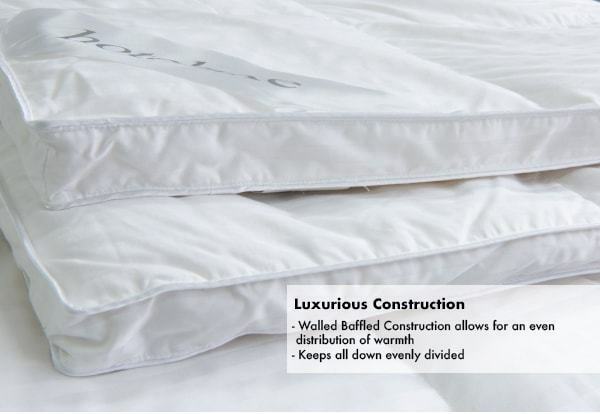 We recommend baffled walled cassette construction for even distribution of warmth to give you premium sleeping comfort. 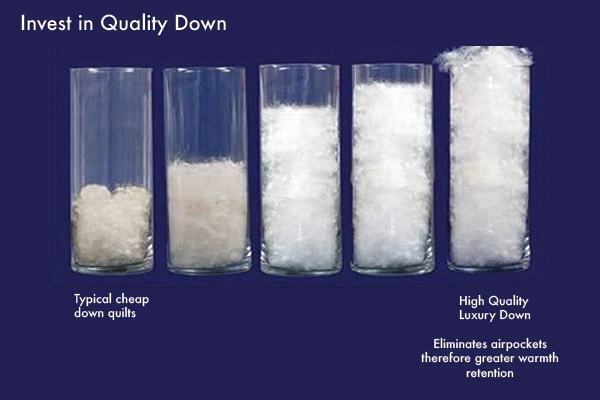 Inferior down quilts dont prevent the down or feathers from shifting around overnight. Unfortunately, this leads to uneven warmth and discomfort. Our quilts are manufactured with only the highest standards in mind to ensure years of even, well-regulated comfort. Air well before use. Fluff and air frequently. Dry clean only (p). Air thoroughly after dry cleaning. 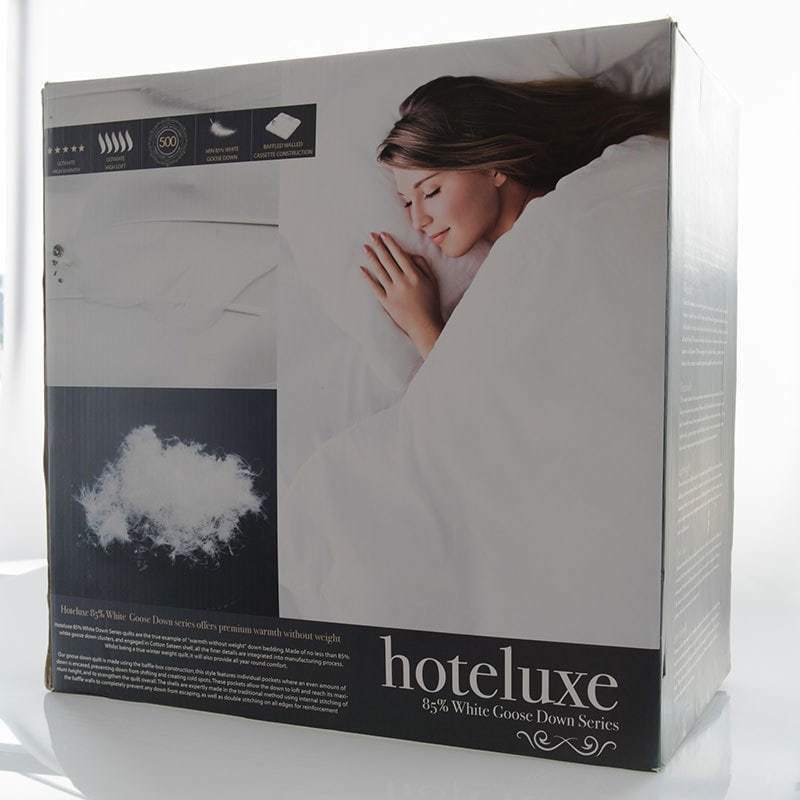 To gain the most from your quilt we recommend that you fluff and air frequently to maintain it's loft and softness. Quilts should be used with a cover always. Failure to do so might cause premature wear and tear. Prior to use, once unpacked shake the quilts and pillow to help fluff up the filling. Air thoroughly before using. When not in use for long periods of time, your product should be stored in a dry and well-ventilated closet or room. Regular airing and lofting, wherever possible will help keeping your product well maintained. 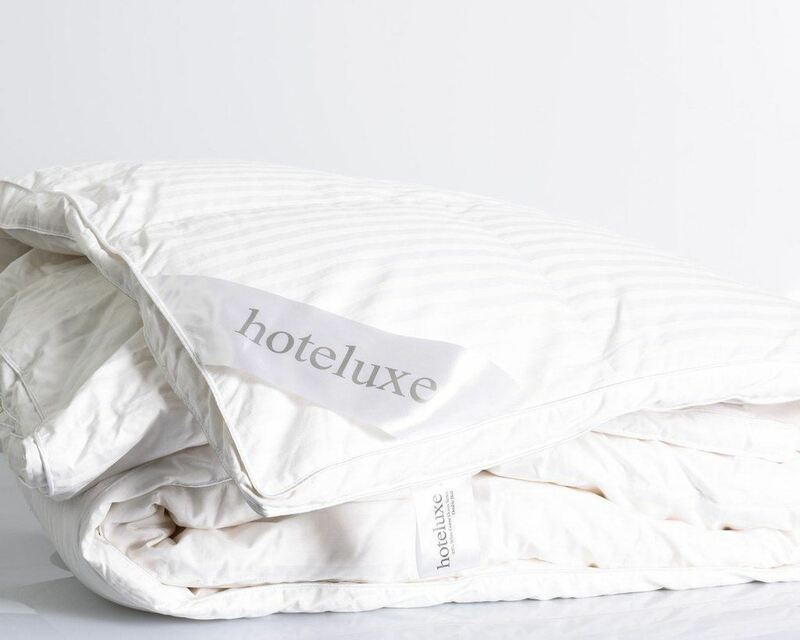 As goose down is a natural fibre, it holds superior thermal properties to synthetic fibre alternatives, requiring less filling to stay cosy and warm. This means that the quilt stays toasty warm whilst remaining light and soft. 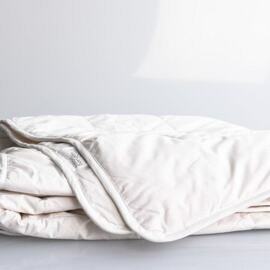 Stitched into a box walled construction, the down and feathers remain evenly dispersed across the quilt, keeping an even warmth across the bed and eliminating cold spots. Create your own irresistible haven with soft, billowing bedding that only luxurious goose down clusters can provide. Fall in love with the mere sight of your bed after just a single night in your new down quilt. Once you sleep with down you never change. 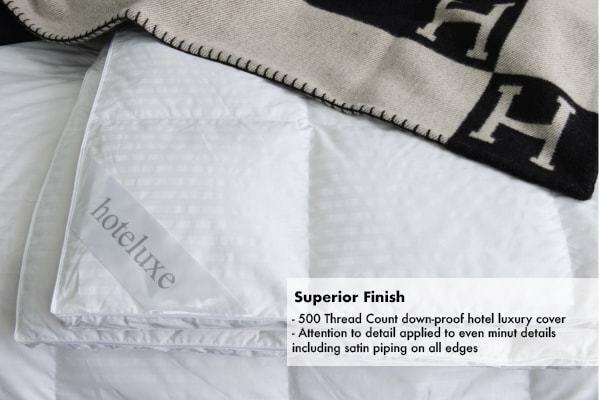 Natural superior warmth rentention properties that only Goose Down is famous for.